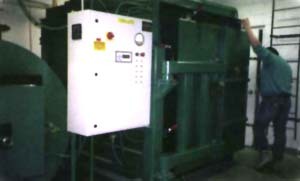 Source: Eco Waste Solutions Inc.
Eco Waste Solutions Inc.re is engineered to be an environmentally safe system for the cremation of pets and animal carcasses. Designed for on-site use, the system is efficient and is said to produce virtually no atmospheric emissions and meet all international environmental air standards. The cremation process results in an inert, non-toxic ash that can be handled as regular waste. Standard designs are available for capacities of 300 to 2,400 lb/day, and can be customized for individual applications. It is a fully automated operation featuring remote monitoring and diagnostics for on-line troubleshooting and automated record keeping for compliance with environmental permits. The ergonomic design allows for the operator to stand up-right inside the chamber, and the small equipment footprint is designed to fit into an area 20-ft x 20-ft x12 ft.